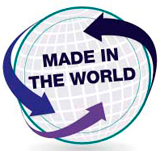 In line with my suggestion that labels simply say “made in a series of places”, the WTO has announced a “Made in the world” initiative. It aims “to support the exchange of projects, experiences and practical approaches in measuring and analysing trade in value added.” “Made in the world” should be a valuable initiative, at least until the arrival of interstellar trade. This entry was posted in Measures, Statistics & Technicalities, Outsourcing, WTO on 18 April 2011 by jdingel.